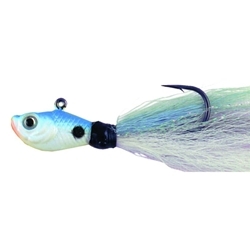 The Spro Bucktail Jig is not like any other jig on the market. the unique shape and design of the head helps bring this lure to life. With bulging eyes, holographic finish, and blazing color, it puts fish at your mercy. Plus the SPRO Bucktail doesn't fall or hang straight down like other bucktails, it glides through the water, almost swimming along. When jigged, it's body stays almost parallel to the bottom maintaining a very natural appearance. Features strong super sharp Gamakatsu hooks.